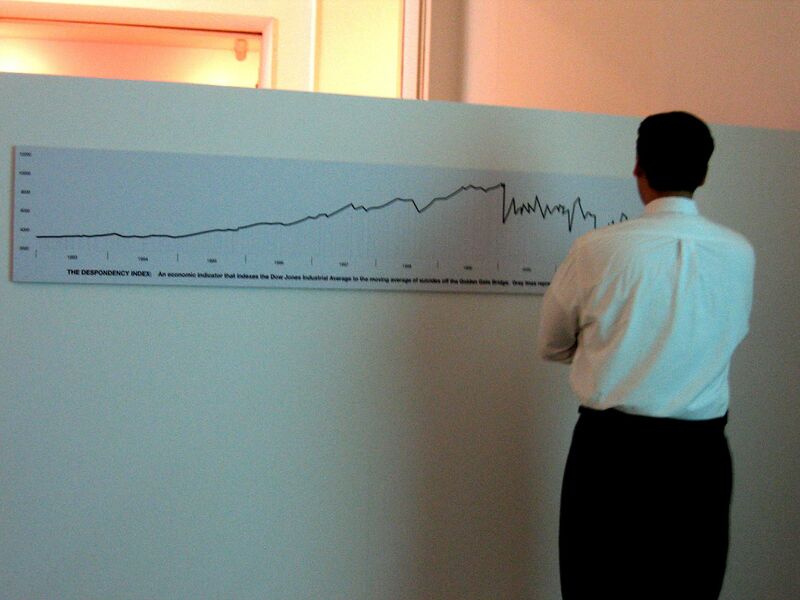 Natalie Jermijenko created "Despondency Index" in 2003 as part of the Bureau of Inverse Technology (BIT). The piece is a ten-year graph which indexes the Dow Jones Industrial Average to the number of suicides off the Golden Gate Bridge. The piece was created as a follow up to a 1996 BIT piece entitled "Suicide Box", in which a camera faced towards the Golden Gate Bridge automatically recorded vertical movement. Although the Port Authority only reported 13 incidents of suicide during the 100 day period the system was installed, seventeen incidents were recorded on tape. These recordings were then exhibited as a continuous stream of footage. The graph, among other data, was briefly displayed on the LED displays of New York cabs as part of the "BIT cab" project, before it was shut down. The lack of correlation between the two figures is meant to draw attention to the way in which the Dow and NASDAQ indexes are used as measurements of the health of the nation by news media. This relationship was particularly evident in the reporting during the days following September 11th, 2001, as if the figures represented the losses sustained.